Throughout its first season, the strength of The Gifted, Fox’s other, not-so-trippy X-Men TV series, has not really been any particular fidelity to the tone of the X-Men comics (which even at their more emotional and grounded are—on average—a lot more out-there than this scrappy mutants-on-the-run family drama), or even the X-Men feature films (which at their best have a certain elegant pulpiness also missing from this series). What The Gifted has on a lot of more prestigious TV (including its fancy cousin Legion) is a snappy pace, and a willingness to actually operate as an action series. There may have been some repetition and plenty of weak spots in its first 13 episodes, but most of the time, the damn thing moves in a way that makes semi-old-fashioned genre TV seem, if not hip, certainly palatable. That momentum continues in “eMergence,” the show’s second-season premiere. There isn’t even time for one of the show’s cold-opening flashbacks. The first one of Season 2 is a flashback in the sense that it takes place some time before the events of the rest of the episode, but it doesn’t really delve into the show’s backstory, as it immediately follows the events of last winter’s season finale, where Andy Strucker (Percy Hynes-White), Polaris (Emma Dumont), and Sage (Hayley Lovitt) left the Mutant Underground good-guys to join up with more radical and less murder-averse mutants who want to re-start the Hellfire Club. The sleek Hellfire Club... boardroom, I guess you’d call it? is the setting for this scene, which introduces Reeva Payge (Grace Byers) and her brain-frying scream. She clears the deck of characters we didn’t really know anyway, and establishes herself as the new Hellfire Club leader, alongside the Stepford Cuckoos from last season. The show isn’t staying in this particular moment of time; the Lostier flashbacks will return in next week’s episode, and the rest of the episode moves ahead six months, pushing Polaris’s pregnancy to full-term and Andy’s hair into a terrible dye job (it makes sense that he would need to disguise himself as all of the Struckers seem to have faked their deaths, but still, yeesh). We find out a bunch of new status-quo stuff about the Mutant Underground operating in part out of a Secret Hospital Base in DC, where Reed (Stephen Moyer) tries to track his wayward son while Caitlin (Amy Acker) works as a nurse, presumably under a new identity. That’s another Gifted trademark: There are a ton of characters, which can make recapping the plot kind of hellish—I haven’t even gotten to Eclipse (Sean Teale), who has been abandoned by his special lady friend and their unborn child, or portal-making Blink (Jamie Chung), or Lauren Strucker (Natalie Alyn Lind), who continues to help mutants on the run as she’s haunted by her brother’s absence, or the new mutant-refugee the Underground rescues during an early-episode raid, without the rest of her family. To be sure, not all of these stories are well-served; as ever, the irritable Strucker family discussions are foregrounded unproductively, sometimes even unbelievably. Caitlin, Reed, and Lauren bickering about how to handle the revelation that Andy is in the same city as the rest of them is a classic TV-plotting timekiller, where a pivotal event occurs (in this case, Andy leaving his family to join the Hellfire Club) and then, instead of actually pivoting, the story holds in place while other characters must accept something that the audience does not need nearly as much time to process. Sometimes these kinds of delayed or drawn-out reactions are realistic (after all, the fictional Struckers do care about Andy more than a lot of the audience will), but The Gifted undermines any real claims to that angle with its six-month time-jump. If the episode took place in the days following Andy’s abandonment of the Underground, then I could understand a few scenes of his family struggling to deal with the change. It’s a little weirder to hear anyone try to claim that the boy was kidnapped six months after the fact. Like a lot of the Strucker stories on the show, the weaknesses make the characters look stupid rather than human. 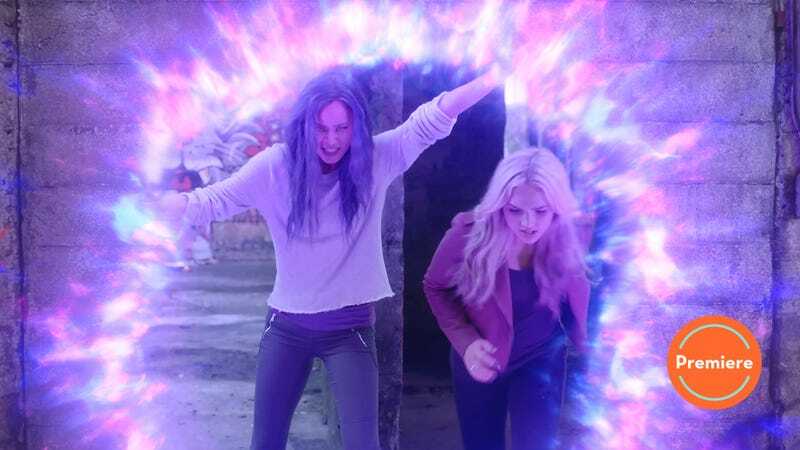 But rare is the Gifted episode where all the storylines fall flat, and this one’s thread about Polaris experiencing some metal-flinging labor pains, as well as some probably justified paranoia that her fellow mutants will prioritize her life over her baby’s, is so good it even gives Andy something to do when Polaris pleads with him to protect her baby at any cost to her. This is exactly the kind of logistical challenge this show has fun with—not that it’s “fun,” exactly, to watch Polaris in pain, but it’s pretty cool to see that pain externalized with flashy effects, which is a very X-Men move: superpowers that are at least as emotionally expressive as they are practical. These touches are always welcome because on a line-to-line level, the show is so often content to live with the practical. “eMergence” expands The Gifted’s Dialogue Cliché Initiative to include worn-out stage directions; in the cold open alone, in addition to the now positively chestnutty line about asking forgiveness, rather than permission, there’s also a sarcastic slow clap. Later in the episode, characters use the phrase “went sideways” not once, but twice. But there isn’t much time to dwell on the show’s clunkiness, because even when it clunks, it clunks fast and keeps moving. In an era of television where 60-minute dramas actually run close to feature length and half-hour-ish shows can feel bloated when they’re not cut down to 22 minutes, a fleet 43-minute show with superpowers and over a dozen characters can feel like a cool breeze, however momentarily. The real question right now is whether this show can keep its momentum going for a second and longer season. Hi, I’m Jesse, and I’ll be your reviewer of The Gifted! This is the rare TV show I’ve reviewed that people seem to watch, so that’s always exciting, and I hope the folks who watched along with me last year are back again! I always learned a ton of X-Men stuff in the comments. Speaking of which: OK, who can tell me who this Wire character, who Caitlin visited for information, is supposed to be from the comics, if anyone? Some cursory research uncovered zero X-Men named Wire, which surprised me, because how has there not been an X-character named Wire, even if it turned out to be a 15-year-old girl who can twist her limbs into lethal piano wire or something, rather than a beardy, drugged-out hacker? Is this character totally a Gifted invention? Either way, he’s one I’d love to see recur, even though part of me thought during his scene: aw, this could have been a third completely different take on Caliban! Think about what a pain it must be to track Andy for months. Sure, he has mutant powers, but he also has bad hair and a sour personality, and lord knows there are plenty of teenage boys who fit that description. Plus, it’s a task where, when you succeed, you get Andy back. Jamie Chung remains the only cast member who has shown real adeptness (on this show, anyway) with banter, be it sarcastic or flirty. I hope Blink and Thunderbird get some more fun lovey times before the show inevitably puts them through Relationship Drama. Reed is taking pills for secret mutant headaches but they sure don’t cure his emerging powers or even his boringness. Oh yeah, and Polaris has the baby! Eclipse semi-inexplicably thinks she’s dead because the lit-up power lines suddenly went dark? (Were they supposed to glow forever? I wasn’t completely following his logic there. Maybe this is something else commenters can weigh in on.) Her name is Dawn! Not Aurora! Poor Eclipse. More immediately: It does not seem like a good idea to do a longer season of this show. 16 episodes is too many. The pacing of the premiere is still on-point, but last year overall could have been fine at 10 episodes.